I was asked to make some new bedding for a family’s little girl (5) who was graduating from her crib/toddler bed into brand new bunk beds. Her toddler bed had various bedding – a bed skirt, sheet, pillows & blanket. We talked about what would be best and we decided that a duvet cover instead of a quilt would be most utilized.The aim was to make two matching duvet covers for each bunk. I carefully took all the old bedding apart, washed it all, ironed and began to assess how much fabric we had. 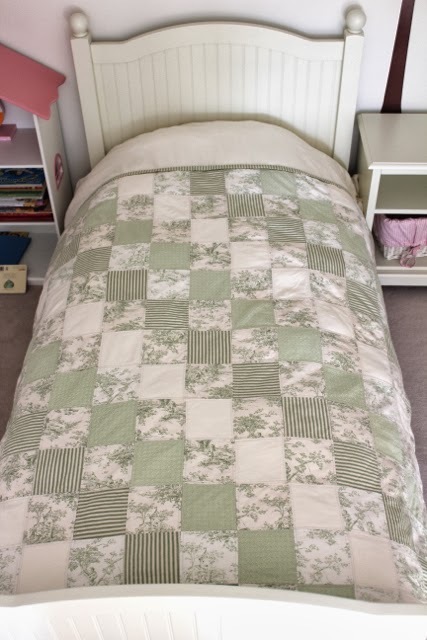 The family wanted a very classic calm design and we decided on plain squares – keeping them 5″ in size so the duvets would seem classic but still modern. I am pleased with the result. They look like something out of a Pottery Barn catalog. The flannel duvet covers are so soft and the weight of the quilted top make them feel very expensive – I’m not sure anyone would guess at first glance that these are a recycled project.